Occurence Gardens including borders, paved areas and beds. Spreads quickly, taking over lawns and grassland. 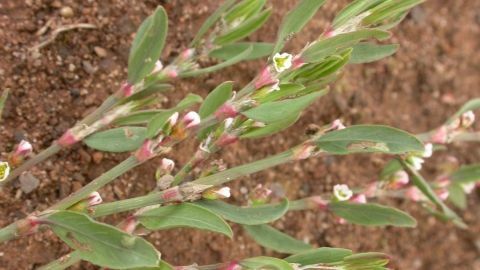 Knotgrass can grow up to 50 - 60cm and can usually blooms between the months of May & October with small, very pale pink / white flowers that grow close to them stem. Knotgrass is a widespread weed and tends to grow across the geound and spread across the soil surface. Knotgrass can be identified by the leaves, which vary in size but are leathery and oval shaped on a short stalk. They start off rolled up but flatten out as they grow older. Knotgrass can spread by seed or rhizomes and will eventually compete with your chosen variety of turf or lawn grass and can take over. It can grow in a variety of places including through the cracks on driveways or paths and grassland. Knotweed prefers sandy / gavelly habitats. We recommend keeping soils as aerated as possible as this will discourage knotgrass to grow, for full control we recommend the below products.